MOUNTAIN HOME, Id.– An Air Force base in southwestern Idaho has removed a Scripture-based painting from one of its dining halls after a complaint was submitted by an activist group that seeks to keep religion out to the U.S. military. Last Friday, the Pentagon received a letter of complaint from the Military Religious Freedom Foundation (MRFF), which urged Air Force officials to remove a particular painting from the Mountain Home Air Force Base. MRFF is a nonprofit organization dedicated to enforcing the U.S. Constitution’s Establishment Clause, which states that “Congress shall make no law respecting an establishment of religion.” It believes that the nation’s Armed Forces should be strictly nonreligious in nature. 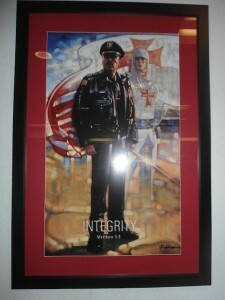 The painting to which the MRFF objected is titled “Blessed are the Peacemakers,” and features images of a modern day policeman standing in front of a medieval crusader, with “Integrity” and “Matthew 5:9” written on the bottom. The artwork was created by Ron DiCianni of Tapestry Productions Inc., and until last week had been hanging in one of Mountain Home Air Force Base’s dining halls. After receiving the email, the MRFF immediately jumped to action, urging Pentagon officials to get rid of the questionable artwork. Less than one hour later, “Blessed are the Peacemakers” was removed from its display position at the Air Force base.